Palo Santo is a mystical tree that grows on the coast of South America and is related to Frankincense, Myrrh and Copal. In Spanish, the name literally means “Holy Wood”. Palo Santo is burned in ceremonies by Shamans and Medicine people for its energetically cleansing and healing properties similar to Sage. It creates a pleasant, fresh smelling smoke with hints of mint and citrus. It raises your vibration in preparation for meditation and allows for a deeper connection to Source. 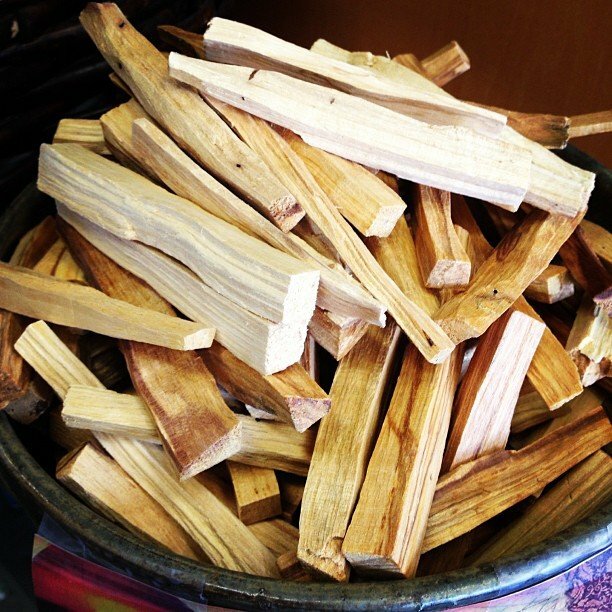 It is also said that Palo Santo enhances creativity and brings good fortune to those who are open to its Magic.Palo Santo is traditionally used for relieving common colds, flu symptoms, stress, asthma, headaches, anxiety, depression, inflammation, emotional pain and more… The oil can also be used during massage work to seal intentions while calling in Spirit Allies for support and protection.